Last weekend I managed to finally get my Barkas up and running, and after fixing a few coolant leaks I managed to take it for a drive around the block. Some issues occurred however. Sorry for the long post! 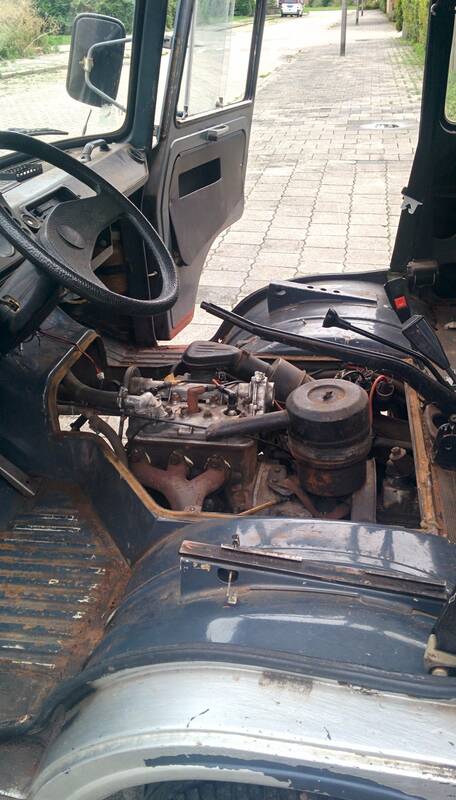 First start: Engine in stationary, clutch pressed in: started & ran fine, also with the clutch pedal up again. I had no idea where the reverse gear is, as the plate on the poke was missing. Some internet searching later and I noticed where it was. First drive: I put the car in first gear, pressed the clutch down, started the car: It went forward for <1 meter, even though the clutch was pressed in. It stayed stationary after that. I let the clutch come up, and it started driving (as expected). After 10 meters, it popped out of 1st gear. I pressed the clutch down again, and managed to drive around the block, testing 1st, 2nd and 3rd gear. I noticed that when pushing the lever up, it moved stuff in the gearbox. Information on the freewheel is scarce on the internet, so I pushed my luck. When moving it further up (as seen from the picture), I managed to get the gear lever in reverse (which is probably coincidental.) After starting the engine and releasing the clutch pedal, the car started moving reverse as well, also as expected. Switching from reverse to 1st gear however, wouldn't work when the engine was running. With the clutch down, I couldn't press the lever into 1st anymore, it made a slight whining sound. Turning the engine off, putting the lever in 1st gear and then starting it up again allowed me to drive forward again. After this, I had to turn off the engine every time I wanted to switch from reverse/forward motion gears. When I finally wanted to park it in the garage, it wouldn't go in first anymore. After starting it agian on sunday, moving the lever into reverse gear while the engine was running (clutch pedal down), would grind the gears. I stopped trying to drive after this. With the lever in the position it is in like in the picture above, pushing the car forward in gear 1 to 4 (engine off, clutch pedal up), didn't rotate the engine. Pushing it backward did move the engine. Caused the cable to hang loose, but the engine rotated in all gears when being pushed, either forward or backward. I expected this behaviour, but I am slightly confused as the lever was never in this position since I bought it. Despite the lever position, the car will not engage any gear at the moment without grinding gears. I suspect the clutch may not be releasing properly, but since I have no clear idea of how the freewheel operates, I hoped to find answers here. I dont know about the freewheel system on a barkas, but sounds like you have a cluch problem. i guess it's not fully releasing. try adjusting the cluch cable. Yeah the Clutch is indeed what I'm suspecting at this point, although I don't understand the part yet of flipping that freewheel lever and then seeing the engine move or not whilst being pushed in a gear. As for the clutch, I suspect it being mechanical, as the clutch seems to have a cable, and the pedal movement feels mechanical as well. 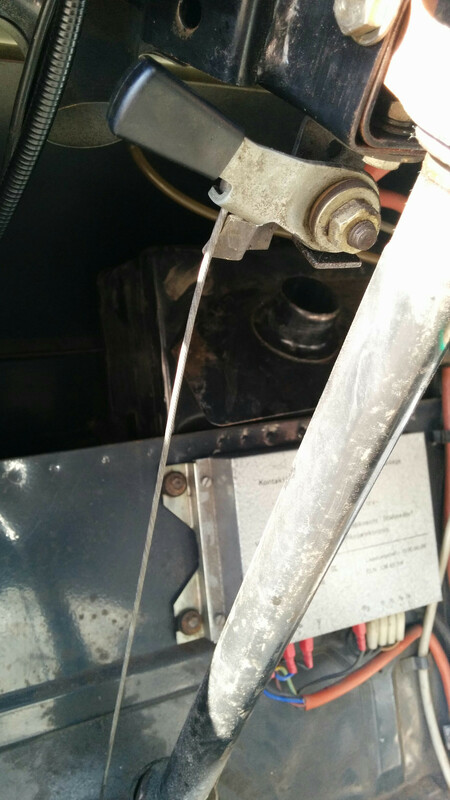 I have one picture on my phone which shows the tube in which the clutch related cable seems to be moving (the orange bit) The big spring on the other side of the gearbox is the one that moves when pressing the pedal. I'll investigate once I get home from work and perhaps take some better pictures. 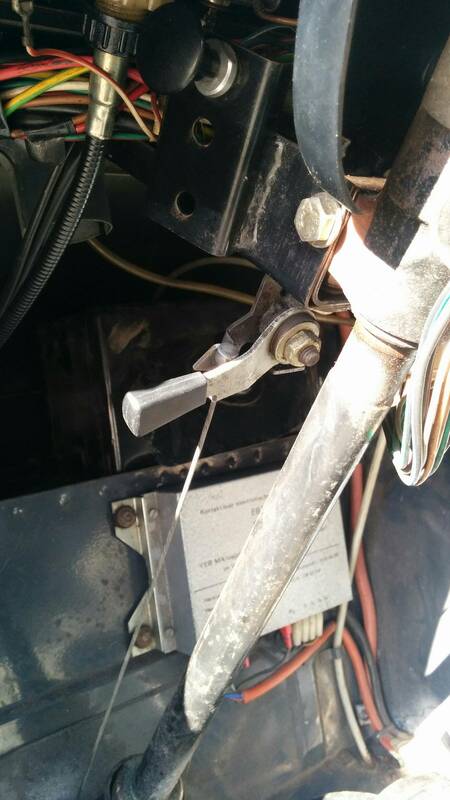 Are there any diagrams or such for adjusting the clutch pedal? Good advice! I am still a little confused as why it was allowing me to shift from 1->2->3 just fine in that first drive around the house though. I assume the freewheel lever should be in the upper position, as showed in the first picture, during this attempt? Could anyone else on this forum perhaps explain how the freewheel lever works, and what it's default position should be? I was going to scan and post the page from the English language Wartburg owner's manual but the English is so bad, it only confuses matters. The Barkas forum mentioned is your best bet I think. It's quite simple. Push the lever down, and at the same time verify that the lever did go all the way on the transmission. If it didn't, then rock the van in gear (engine off) and help the spring what supposed to be on the transmission at the end of the freewheeling cable. The reason for the freewheeling is to prevent the engine from running without lube. Your lubricant is in the fuel. If you use engine brake (free wheel turned off), the engine won't get lubed and will fail prematurely. So if you decide to turn it off, you will need to learn NOT to use ANY engine brake but keep putting the trans into nutural. Try not to keep pushing the clutch padal in too long for this reason. You can adjust the clutch engagement by removing the air filter housing and reposition the clutch housing retainer clip or simply adjusting the nut at the end of the arm. Proper play is essential! You can remove the large rubber dust cap from the top of the bell housing and look down and see the gap. Or simply move the clutch lever by hand in and out and set up the gap this way. One more thing to check. The throe out bearing is actually a round carbon pace. It's sitting in a metal housing. That metal housing has two ears what sits into the clutch lever (fork). And just to be sure there are two clips what holding the throe out bearing to the clutch lever (or fork). If one of the clips is missing you will have the problem you described. It's visible and acsessable from the top of the bell housing if you take off the rubber dustcover with the holes on it. CHECK THE PROPER OIL LEVEL!!! Wet transmission shifts and drives lot lot easier!!! It has a dip stick on the driver side, over the differential housing. The filler hole is on the top. It has a cap what just pulls off. I have 4 Barkases, 2 currently in use... Let me know if this helped.